WEST VILLAGE, N.Y. — The Finnish rap artist known as Signmark has a record deal with Warner Music, has performed extensively in five continents and has the respect of his peers for his groundbreaking work. But the 32-year-old rapper has never heard any of his own songs — or any songs for that matter — because he's deaf. Signmark, whose real name is Marko Vuoriheimo, is one of the world’s first deaf rappers to score a deal with a major label. Other deaf rappers hitting the music scene include Sean Forbes, who was recently signed by the label that helped catapult Eminem to fame. On Sept. 23, Signmark gave a performance entitled "Silent Shout" in Washington Square Park, amassing a crowd of both the deaf and hearing. More than 100 people rocked out to his tunes, which were vocalized by partner Brandon Bauer and fellow visiting Finnish rap artist Osmo Ikonen. "The music is proof that anybody can do whatever they dream of," Signmark told DNAinfo through a translator. His Thursday appearance coincides with International Week of the Deaf. 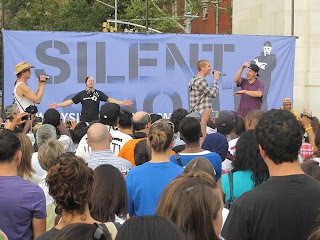 Signmark not only performed his new hit song, "Against the Wall" in American Sign Language (ASL), but taught audience members its sweeping gestures. He beckoned Finland’s Minister of Foreign Affairs, Alexander Stubb, on stage for a demo, before hopping into the crowd. "I’ve been here for three days and three nights, and this was the funnest part," said Stubb, who helped organize the event through the Finnish Consulate of New York after being inspired by one of Signmark’s performances in Helsinki. Signmark performed songs from his newly released second album "Breaking the Rules," a ten-track collection that includes videos in sign language. The beat and bass-heavy songs, such as "Smells Like Victory" and "Talk to the hand," carry themes of empowerment and personal triumph. "My attitude always been like I don’t back down," Bauer rapped to the crowd while Signmark, who also reads lips, performed along. The rapper got his start by translating Christmas carols for his parents, both also deaf. He said his goal is to show deafness is not a disability, but rather a linguistic minority, and uses expressive facial and body movements to convey the lyrics of his songs. Jesse Werner, a student studying sign language at NYU, came to the event after her teacher informed the class. "I think it’s interesting because people don’t realize the magnitude of deaf culture," she said. For deaf Queens resident Ioana Visiecescu, who signed with friends while waiting for Signmark to come on stage, the music was about normalizing deafness. "It doesn’t matter if you’re hearing or deaf," she said. "The appearance was brilliant," he said through Dudina. "It brought two worlds together."